Yves Lambert is a back-country musician with a kamikaze style, whose 36-year career has been full of risks, adventures, and challenges. Over the years, he has become a veritable patriarch of Québec’s musical roots revival. 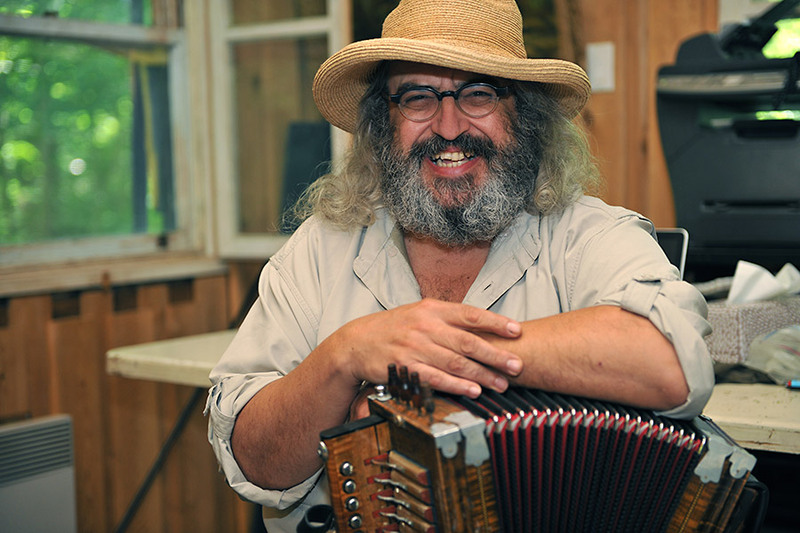 In 1976, he founded legendary group La Bottine Souriante along with friends Mario Forest and André Marchand. It was a band that was to have a major impact on Québec musical heritage and give birth to a renaissance of traditional music. Throughout his 26 years as a member of La Bottine, Yves was a solid link between the various incarnations of the group, its heart and soul. From 1976 to 2003, he toured Quebec and the world, winning numerous awards both at home and abroad with this iconic group. Beginning in 2003, his desire to explore new creative directions led to a series of award-winning solo and project albums, including the 2010 album with two musicians who have been frequent musical partners since 2004 – Olivier Rondeau (guitar, bass) and Tommy Gauthier (violin, mandolin, bouzouki and traditional Québécois foot percussion). Together, they brilliantly demonstrate how traditional music continually reinvents itself within a modern context.